Here’s something to give you the creeps: the Catholic Church has warned of a proliferation of “Satanic” rosaries that look normal at a glance, but were allegedly “cursed” through Satanic rituals. 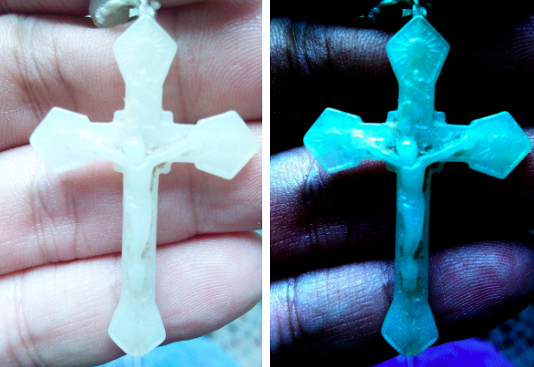 A priest in the largely Catholic country of the Philippines said they were able to confiscate one of the rosaries, which bears symbols on the cross that are not readily visible to the untrained eye. Philippe de Guzman, assistant case officer of the Office of Exorcism in the Diocese of Novaliches said they were able to identify the cross as the cause for some eerie disturbances in the house of a local, who had been unwittingly using the rosary. The rosaries are often made of plastic and could bear the symbols of a snake wrapped around the cross, a pentagram, or a sun with rays, an insignia of the Illuminati; and are being ‘consecrated to evil’ by some Satanic cults. Fr. Ambrosio Nonato Legaspi, head of the Diocese of Novaliches’ Office of Exorcism said they regarded these items as ‘cursed’. “These were made not only to be simply given away but to deceive Catholics, so that evil spirits will haunt them,” said Legaspi. As if it couldn’t get any more weirder, Fr. Legaspi added that sometimes, the rosary may have no symbols at all. However, the Catholic Bishops Conference of the Philippines denied the existence of such Satanic rosaries, saying that the alleged rosaries could be products from vendors outside a church in Quiapo, Manila.